Paving a path to the future for P&C insurance companies. For today’s insurers, the ability to prepare for the future, whatever it brings, is paramount. The onset and momentum of the digital transformation in nearly every industry was a wakeup call for insurers, highlighting the need for modern, open and customer-centric technologies to support changing customer expectations and a new way of doing business. An insurer’s IT strategy must not only include innovating for digital engagement, but also for data, analytics, and cloud delivery. This means overhauling digital channels and modernizing core business systems to become more prepared for a rapidly changing future business environment. New technologies are only transformative if they are implemented correctly and optimized in line with carriers’ business goals. To reap the full benefits of such systems, insurers need an integration partner with core systems experience, deep insurance industry know-how, and the digital capabilities to handle every possibility. For P&C carriers that invest in Duck Creek solutions to modernize their core systems, Capgemini is that partner. As a Duck Creek Platinum Partner, Capgemini has worked with more than 35 carriers on Duck Creek implementations since 2007. In addition, Capgemini has advanced, industry-recognized digital capabilities that allow us to provide strategic roadmaps to our clients as they embrace the future needs of a connected world. Capgemini’s collective core policy transformation and commercial domain experience, combined with combined with deeply focused, Duck Creek-specific skills, produce unparalleled results in Duck Creek implementations. Our acquisition of TCube Solutions in 2017 broadened our scope of work on existing Duck Creek implementation projects for several of our clients. For others, we now have more options than ever to deliver the best solution for specific needs. 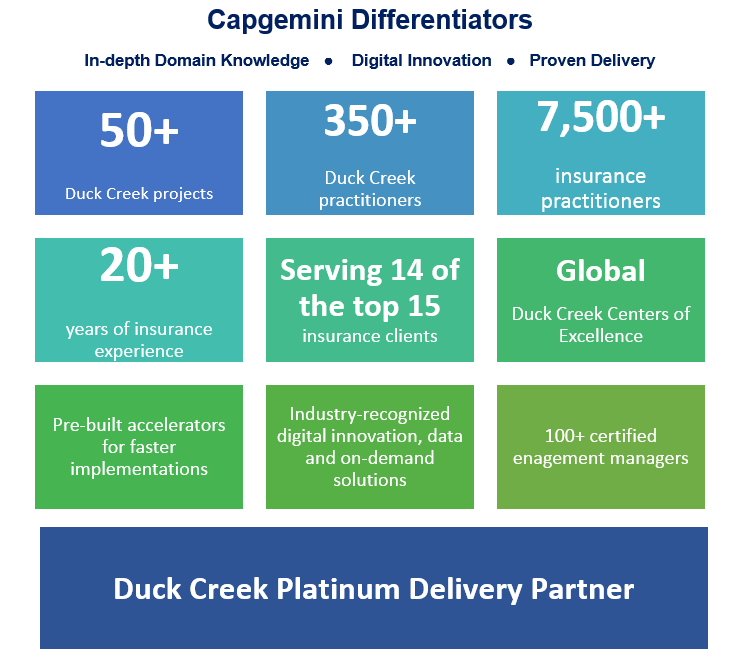 As a Duck Creek Platinum delivery partner, Capgemini is committed to investing in accelerators, tools and methodologies, such as, Software Manufacturing Insurance Products (SMIP), DevOps, Smart QA, and Reinsurance Management, that enable insurers to transform their business with Duck Creek solutions. We leverage our unique and proven accelerators to shorten project timelines, maximize efficiency, and mitigate risks across all core and digital implementations. As Capgemini’s dedicated Duck Creek practice continues to expand, so does our library of accelerators. Whether you are implementing Duck Creek’s full suite or need help with a facet of your policy, rating, billing, or claims solution, we can help improve your business processes. Learn more about our Duck Creek-ready solutions and accelerators in our Duck Creek brochure. Saxon needed to increase traffic to their consumer portal, and to increase engagement with their core systems. Before redesigning the consumer portal, Saxon migrated to the latest Duck Creek software versions to improve system stability and functionality. As part of the portal redesign project, Saxon wanted to add credit card processing. Capgemini introduced Process One, from One, Inc., which gave Saxon the ability to process credit card transactions securely through a simple, intuitive user interface. Capgemini also designed and developed a business intelligence system for Saxon, bringing together data from all three Duck Creek core systems. This new BI solution allows Saxon’s CFO to analyze product lines and implement product changes more rapidly, improving speed to market and insight into key business metrics. As an MGU and Business Process Outsourcer, Dovetail needed help managing unpredictable demand for experienced Duck Creek resources. Dovetail needed a scalable partner with deep experience to help them augment their existing workforce. The company was also facing challenges with its legacy commissions processing approach, which was highly manual and had resulted in audit issues. Dovetail wanted to automate this process and ensure clean auditability. Capgemini introduced a flexible, cost-effective resource model whereby developers can be added accordingly based on requirements and urgency. We also produced productivity improvements via a proven onshore/offshore development model with a 24-hour cycle.